A day that I'd have celebrated with pomp at home - I was all alone in Bangalore. I hadn't slept at all the last two nights, and the effect of that was heavy on me. I somehow managed to get off the bed and get ready. The taxi I had booked hadn't arrived yet. The taxi came about 15minutes past the reserved time - and it turned out that it was the same driver who ferried me from the airport to my office the previous morning! He was quick, and had a very nice control of the vehicle. I got to the airport by 0642, less than hour from home. Quite incidentally, I, the same cab and the same driver was at the airport at around the same time even the previous day! I was terribly hungry, and headed to the Chai Point outlet. I got into the terminal a little later, at 0703hrs. One thing that baffled me was the crowd at the terminal entry gates. 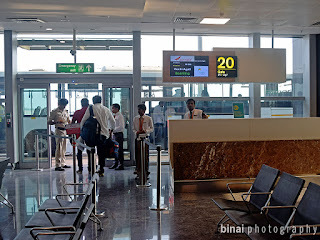 It was quite deserted when I reached the airport, but the crowd swelled heavily in the 20 minutes that I spent outside the terminal - a wrong decision from my end. 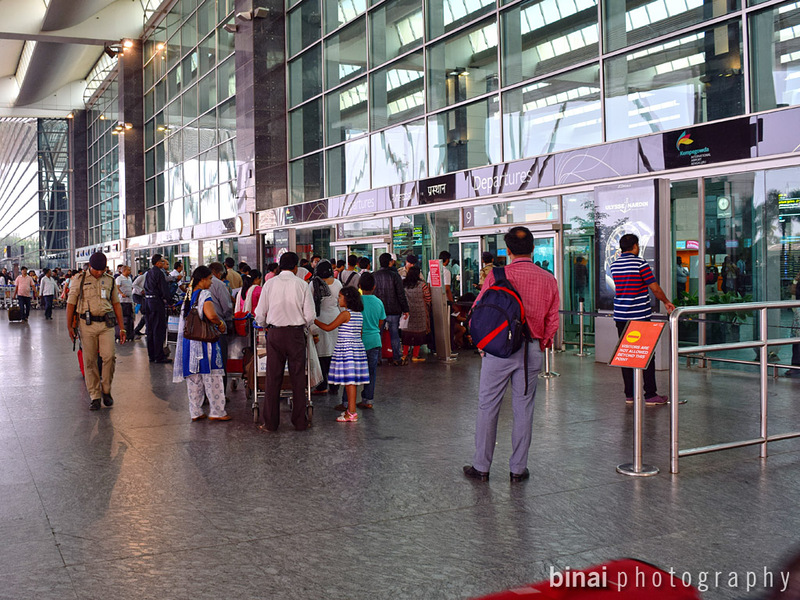 The terminal was crowded - heavily crowded. 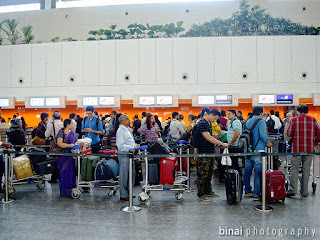 I witnessed the heaviest crowd at the Air India Counters this time. The queue moved very slow. Even as the clock ticked past 0715, I was not even half the length of the queue to the counters. I had exactly an hour left for departure now. 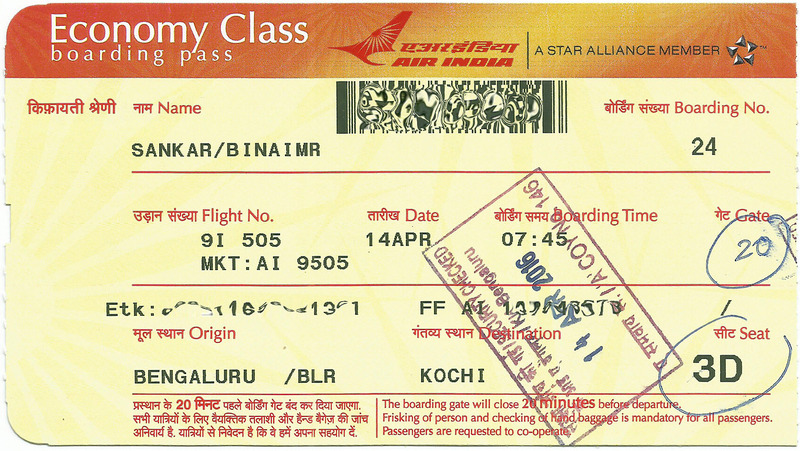 About a couple of minutes later, AI staffers started calling out for passengers to Kochi and Agatti - thats my flight. I raised my hand - he quickly checked my ticket and let me get out of the queue and move to an executive class check-in counter instead. The crowd to get into the airport.. The crowd at the AI Counters..
My boarding pass.. Seq #24.. There was some problem with the terminal equipment - boarding was processed very slowly. I got my boarding pass by 0724hrs. I was left with exactly 20 minutes to go for boarding. 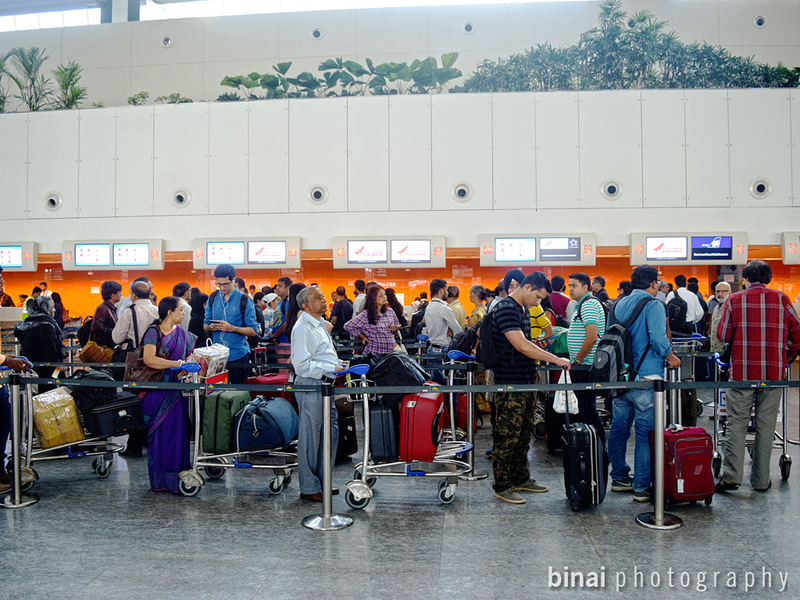 Given the crowd at the check-in counters (not only Air India, but also other airlines), I was afraid if security would also be a mess. But, I was somehow lucky - the crowd there was less, and all the frisking queues were open. The queue moved fast. I cleared security by 0732 and headed straight to the gate. This particular flight of Air India always departs from the last gate - #20, located at the other end of the airport. It was a long walk to reach there. And, just as I reached there, boarding had already been called (0737hrs). As I neared, they were, in fact, calling out for passengers. I got into the tarmac coach by 0740hrs. 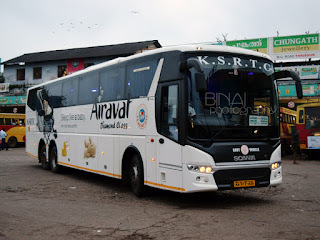 The coach started moving by 0745 (the boarding time). There was just one bus load of passengers. The aircraft, as seen from the Tarmac coach.. 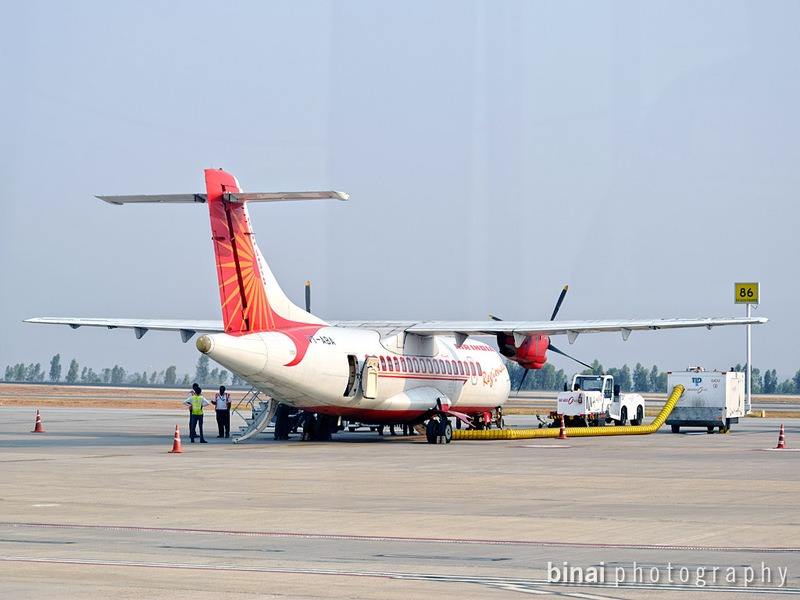 The aircraft was parked right on the opposite side of the apron from the boarding gate. The bus ride took some time, since there were a couple of aircraft movements at the time. 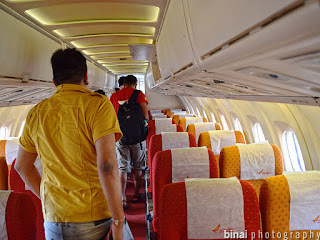 We got to the aircraft by 0750hrs, and I was inside the aircraft by 0752hrs. The aircraft was VT-ABA - an ATR42-320 (cn:390). The aircraft was originally delivered to Lineas Aereas Navarras in March 1995. 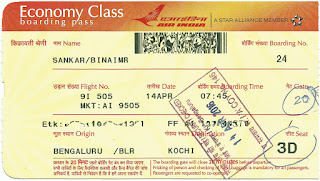 It changed many hands before it reached Alliance Air (the predecessor of Air India Regional) in February 2003. The aircraft was a good 21 years and 1 month old as on date of my flight. Perhaps the oldest aircraft that I've traveled in. The interiors seemed to be in good shape. Leg room at my seat (#3D) was pathetic. The windows were messed up - full of scratches. The aircraft, surely, was clean. The loads seemed quite light - probably a shade over 50% mostly. A boarding completed call was made at 0758hrs, followed by the welcome announcement. 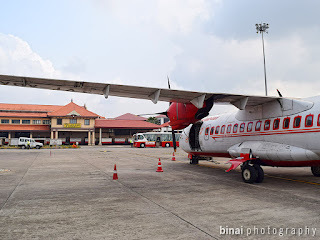 The aircraft flies six times a week from Bangalore to Agatti (in Lakshadweep) via Kochi. The DGCA Stats show that there are very few direct passengers - but the aircraft certainly sees healthy loads between Kochi and Agatti. The cabin crew - headed by Ms Prema, did quick rounds to ensure that the cabin was prepared to take off. Flying us today was Capt Marcelo, who did make a welcome announcement before take-off, signing off with a "Sit back, relax and enjoy Air India" announcement. Doors were armed at 0801hrs and we were pushed back at 0802hrs. 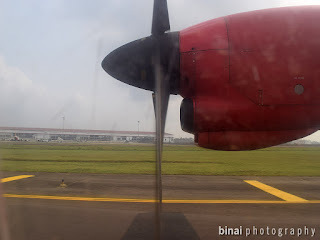 The aircraft shook vigorously as the PW121s came to life - the characteristic smell of burning fuel which happens in Turboprops added to the turboprop experience. We commenced taxi at 0806hrs - perhaps the shortest taxi ever. We entered the active runway (Rwy27) through taxiway "B" at 0807hrs, and made a rolling take off at 0808hrs. We were airborne in about 2 minutes (or less) from the time we commenced taxi! The aircraft climbed quite soon - I played the identification game, trying to figure out landmarks below. The seatbelt sign was turned off at 0814hrs. 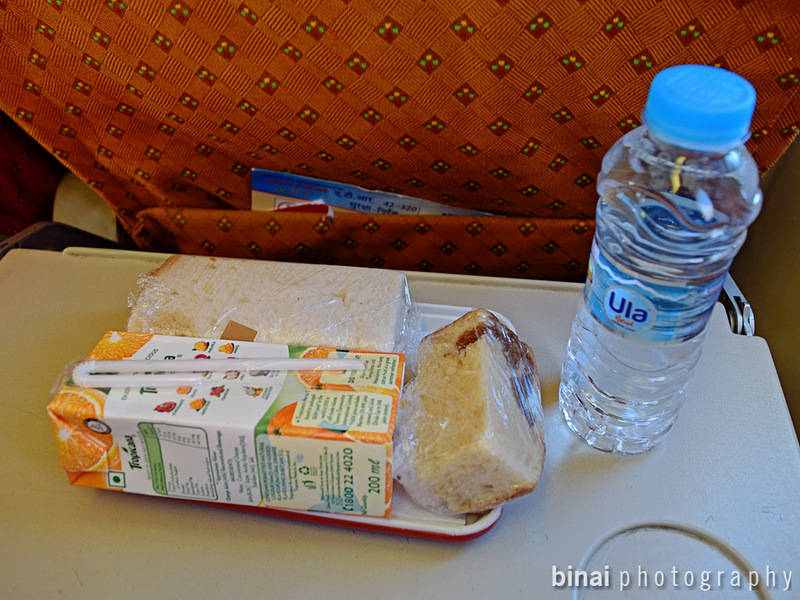 Unlike my previous experience, Air India Regional (what I fondly call as Regional Maharaja) now offers Light vegetarian "Snacks" on board its flights. 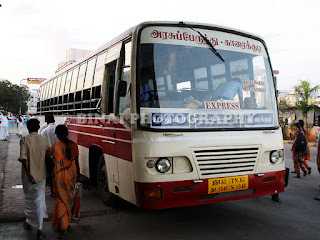 The trolley rolled out soon, and trays were handed over to passengers. The tray contained a cheese sandwich, a piece of cake and a fruit juice. The sandwich had only cheese in it - no vegetables at all. The cake was very good. The fruit juice was a tetrapak service of Tropicana Orange (not my personal favorite). This light snack was heavier than what is passed off as a meal by the market leader! 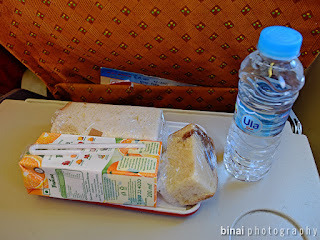 The flight was largely eventless, and I spent most of my time reading Shubh Yatra, the inflight magazine of Air India. 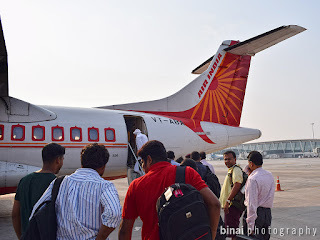 I spent quite a lot of time understanding the routes served by Air India - especially their widebodies on domestic sectors, and sectors served by the Regional wing. They do have a lot of underutilised ATRs (the newer, ATR72-600s). We were cruising at FL180 (as I learnt from my phone). Soon after touch down at COK.. The cabin crew spent most of their time chatting, in the galley - but they responded to calls very quickly. The seatbelt sign was turned on at 0859hrs - just as we were flying over the western ghats, giving a nice view of the tourist district of Idukki. We touched down on Rwy27, at 0917hrs, and docked at Stand #7 by 0919hrs - well before the scheduled arrival time. This flight is the slowest in the sector (all thanks to the ATR42), with a flying time generally in the range of 70-80 minutes. 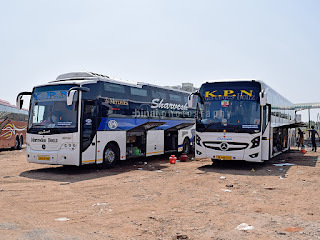 A tarmac coach took all the passengers to the terminal, and I made my way out of the terminal by around 0925hrs, ending what I hope is the last journey for some time - need to take a break, but I doubt if that would be possible, though. At Stand #7, Cochin International Airport. It was a no-nonsense flight. The aircraft showed its age - it vibrated and shook badly. It was noisy as well. The interiors were clean and the crew were functional - no exemplary service from them, but they did respond to calls and did their job well. The flight was eventless, and punctual. 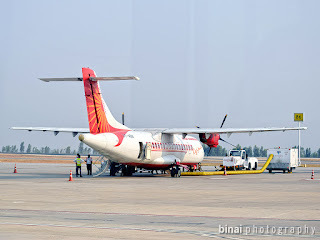 Air India Regional seems to be expanding these days with newer turboprops joining their fleet - I really hope they find newer aircrafts to serve their ATR42 sectors. These ATRs have seen better days and they are a cause for worry with advancing age. 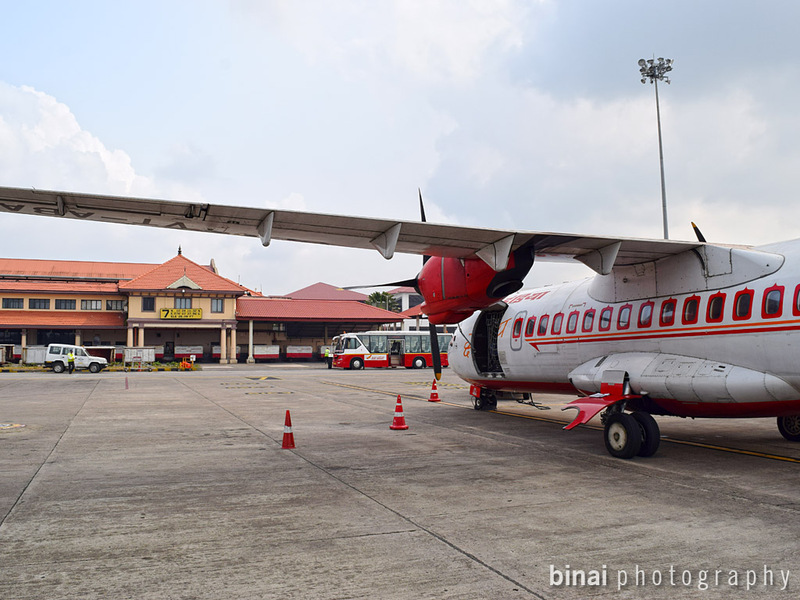 These ATRs mainly serve remote sectors in the North East, and this single flight to the Lakshadweep. If there are airports that can't accomodate the ATR72-600, then AI-R could explore the option of converting a couple of ATR72 orders to ATR42s, probably.